Nasal congestion. If the deviated septum blocks one of both sides of the nose, it will disturb normal air flow which may lead to frequent nasal congestion. Nosebleeds and nasal discharge. Because of deviated septum, the upper surface of the septum dries out causing nosebleeds. The mucus also gets stuck in the nasal cavity causing ‘drips’ down the throat. The blocked nasal discharge can also be the breeding ground for infection. When post-nasal drip is one of the deviated septum symptoms, sore throat may also be present that is often painful. The discomfort associated with common cold or seasonal allergies usually get heightened by a deviated septum. Loud and noisy breathing. One of the very common deviated septum symptoms, this is often seen with infants and small children. Deviated septum symptoms may show up in the form of frequent sinus infections, caused by blocked mucus in the sinus cavity. Facial pain. Blocked sinus often causes facial pain, accompanied by headaches, and pain around the eyes. Check your ability to breathe through your nostrils, and pay particular attention if you can feel any obstruction in one or both the nostrils. The right time to test this is when you have a cold. Keep a close watch on the other deviated septum symptoms like nosebleeds, frequent sinus infections, disturbed sleep due to snoring or postnasal drip. Go for a physical examination of your nose. The doctor uses a bright light and a nasal speculum to spread out the nostrils and examine the inside cavity of the nose. He or she can then determine whether you have deviated septum and also brief you regarding its severity. You can then proceed for treatment according to his or her recommendation. How Can I Alleviate My Deviated Septum Symptoms? 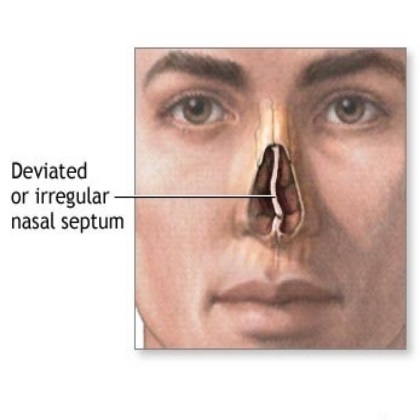 Some of the deviated septum symptoms may be reduced with the help of decongestants or antihistamines. However, these medications will not cure the problem but only lessen the intensity by reducing the congestion, inflammation of the nasal passages, etc. Some consider surgery to be the only permanent solution for deviated septum but this can only be done when the deviated septum symptoms are severe causing serious breathing difficulty. When i was fourteen years old i got hit in the nose and developed a bump in my nose. The bump i have in my nose feels like bone sticking out and my nose now does not look straight. A few years after i got hit in the nose, white mucus started to appear and would drip down my throat if i did not blow my nose. Then right afer my 21 birthday i was hospitalized because one morning i woke up with a severe headache. So my questin is should i get a deviated septum? Or is my mucus problom and the pressure in my forehead being caused my chronic sinusitis? When i was fourteen years old i got hit in the nose and developed a bump in my nose. The bump i have in my nose feels like bone sticking out. In addition my nose now does not look straight. A few years after i got hit in the nose, white mucus started to appear and would drip down my throat if i did not blow my nose. Then right afer my 21 birthday i was hospitalized because one morning i woke up with a severe headache. So my questin is should i get a deviated septum? Or is my mucus problom and the pressure in my forehead being caused my chronic sinusitis? I was hit in my face with a baseball at age six. My nose was broken and I never received treatment, therefore my nose healed, broken, and it flat without a bridge.. When I was younger I always felt that my breathing was different in one nostril, and whenever I was conjested one nostril felt blocked. Recently I have been havjing drainage down my throat, and it has been causing hoarsness for two months because it drains down my throat and get stuck there. I am usually clearing my throat, and get heahaches. I am now 61, and believe that I have this deviated septum, Who do I see to get a concrete diagnoses, and get the rhinoplasty surgery?